Our fondant stripe fabric is inspired by the seaside sweetie treats and we've added a lurex yarn for subtle shimmer too. 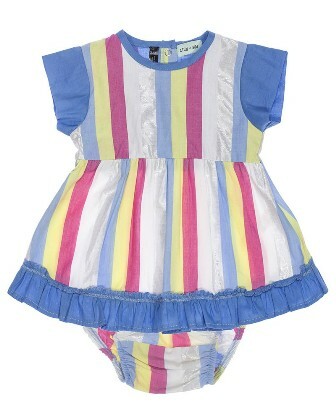 Contrast blue sleeves, hem and pant frills create a pretty look for baby girls- perfect for playdates and parties, this set makes a lovely baby gift. Popper fastening to back neck for easy dressing.